The Index opened positive but saw selling pressure to the lows of the day at 8382. The responsive buyers tried to move the index up from thereon but could close just below the previous day at 8421.00, miniscule loss of 2.25 points. The broader market was weak, with 609 advances to 882 declines. 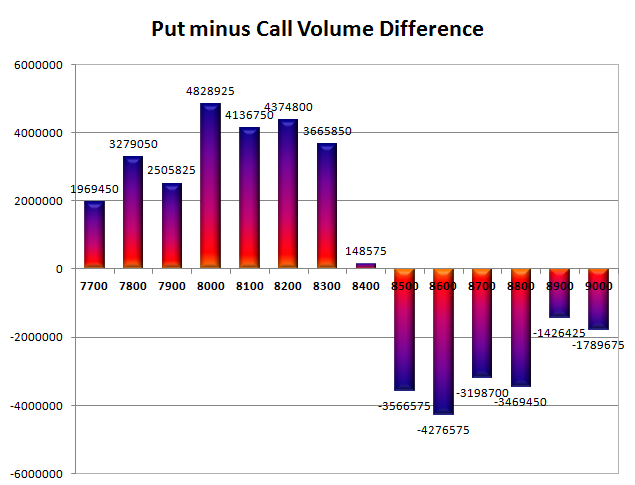 Developing Range as per Option Table is at 8200-8600. 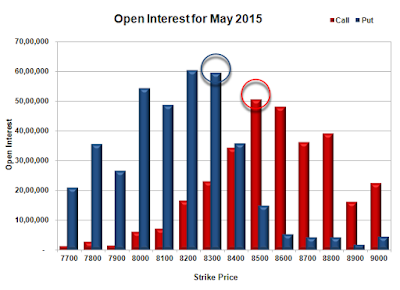 Call option 8500-8600 added 2.79 lacs OI with profit booking seen at 8800 and above strike prices. Put option 8400-8200, 8000 added huge 24.06 lacs OI with profit booking seen at 8100 strike price. Nifty Open Interest is at 1,31,44,450 down by 4,39,025, whereas June series added 4.06 lacs with decrease in price, most probably rollover with small long liquidation. Bank Nifty Open Interest is at 16,99,075 down by 71,375, whereas June series added 0.29 lacs with decrease in price, most probably small rollover with long liquidation. FII’s sold huge 5.50 lacs Futures, which includes 6952 contracts long liquidation and 15043 contracts short build-up, with increase in net OI by 8091 contracts (includes 71952 longs to 93947 shorts for the day) and the Average Price comes to 8934.27. FII’s Index future open contract as on date is 274655 Longs to 289487 Shorts, Net Short 14832 contracts. Initial support at 8400, with OI of 35.85 lacs and below that at 8300 with huge OI of 59.67 lacs. 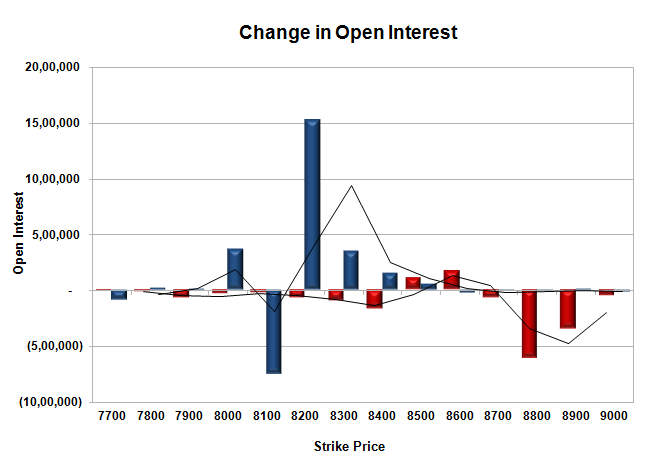 Initial and best resistance at 8500, with OI of 50.50 lacs and above that at 8600 with OI of 48.00 lacs. Day Range as per Option Table is 8336 - 8500 and as per VIX is 8344 - 8498 with 8417 as the Pivot.